I wonder what took me so long to pen down recipes for air-frying dishes. This kitchen appliance is my new love and it really does wonders being a helpful assistance. Not only that I could cooked french fries without oil or little oil, it makes food juicer and cook faster. Here's a grilled dish making use of my newly purchased accessories, the double rack with skewers. 1) Marinate the prawns with all above seasoning for an hour or longer. 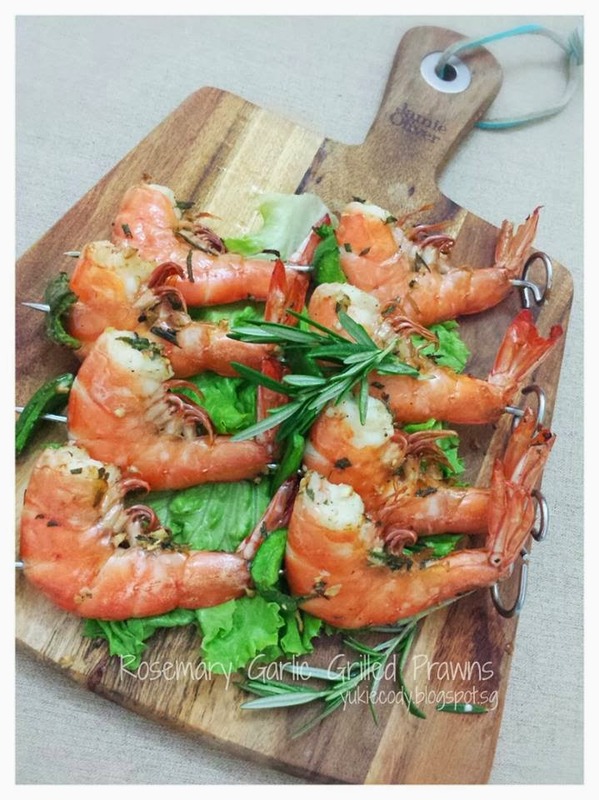 2) Use 2 prawns and 2 capsicum slices per skewer. 4) With temperature 180 degree C grill the prawns for 5-6 mins. 5) Increase temperature to 200 degree C and grill for a min. Sometimes when I ran out of time I will lessen the marination timing for prawns, probably just a 10mins will do. For air frying, you could always open the drawer to check on your food and it is advisable to do so. After all this cooks faster compared to conventional cooking hence is good to check before they turn overcooked. This dish could be done in oven as well. It is much faster to do it in air fryer and the prawns will retain the juiciness. The only disadvantage will probably be the quantity, you can't grill a lot at one go.